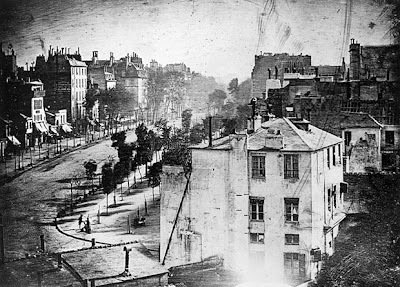 This photograph of Boulevard du Temple in Paris was made in 1838 by Louis Daguerre, the brilliant guy that invented the daguerreotype process of photography. 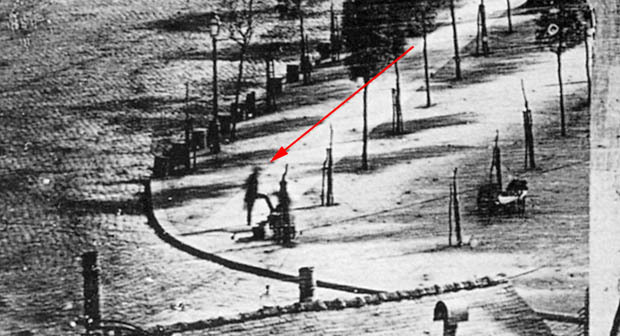 Aside from its distinction of being a super early photograph, itâ€™s also the first photograph to ever include a human being. Because the image required an exposure time of over ten minutes, all the people, carriages, and other moving things disappear from the scene. However, in the bottom left hand corner is a man who just so happened to stay somewhat still during the shot he was having his shoes shined. Its interesting how sheer luck earned the guy a place in the history of photography. Too bad we probably never know his identity.